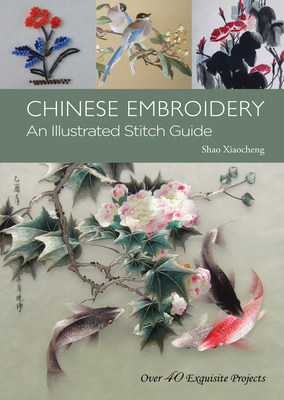 Learn about the history and culture surrounding Chinese embroidery and learn to embroider yourself with this easy-to-follow and beautifully illustrated guide. Embroidery in China is a true art form, one that has been practiced for over 2,000 years. In Chinese Embroidery, you'll discover everything from the history of the art to the different schools in different ages and their styles to knowledge about selection, collection and preservation of embroidered articles. Chinese Embroidery contains over 200 full-color photos of works and step-by-step guides—all of which help to explain and analyze over twenty kinds of needlework and teach comprehensive application of these basic skills. When you reach the end of this book, you'll have learned about twenty different embroidered pieces for daily use and display purposes. Learn about the pattern-oriented art and traditional culture of China at the same time as you master the embroidery craftsmanship unique to China. Stimulate your imagination and creativity as you experience the joy of embroidery with Chinese Embroidery. Shao Xiaocheng is a prominent Chinese embroidery artist who is the Director of the Beijing Shao Xiaocheng Embroidery Research Institute. She is a senior national fine art master of arts and crafts and a member of the Internationale Organisation Fur Volkskunst (IOV) of UNESCO. She has been conducting research into the history, reality, theories and practice of Chinese embroidery while engaged in art creation with great concentration in the past thirty years. Shao Xiaocheng's research covers embroidery varieties on the verge of extinction and those that have become extinct since ancient times. Moreover, she has succeeded in practicing and summing up complicated techniques of repairing and duplicating those embroidered pieces as cultural relics in different styles. She took the lead in bringing the education of embroidery into institutions of higher learning, having actively promoted the inheritance, protection, appraisal and appreciation of embroidery as a Chinese national heritage. Her book Appreciation of Chinese Embroidery has been published and she also has written many papers on embroidery like Getting to Know Four Major Schools of Noted Embroidery before Collecting Embroidered Articles and Collection and Appraisal of Embroidery.